Editor’s note: This story was updated after initial publication to include comments from Dan Blue III. “More importantly, it confirms that the state pension plan has not achieved its stated rate of return the last 15 years, and I think it has a low probability to achieve that in the next 20 years,” Folwell said. “The first 30 days that I’m there I’m going to commit to finding out where this money is, who’s managing it, how good they are at managing it, and how much they get paid to manage it,” Folwell said. “We understand that there are concerns about pension funding nationally. It is Treasurer Cowell and the department’s priority to protect and grow the retirement funds for the benefit of the public servants who have worked hard, and earned their benefits,” said Cowell press secretary Brad Young. He said Cowell “has worked to shore up the retirement funds in the aftermath of the financial crisis,” kept fees low at about 0.5 percent of the fund, and reformed the funds’ oversight by increasing ethics and transparency. The state Treasury Department worked with Buck Consulting and the Investment Advisory Committee, which assists Cowell in developing investment strategy, to review the retirement funds’ asset allocation over the past year, Young said. 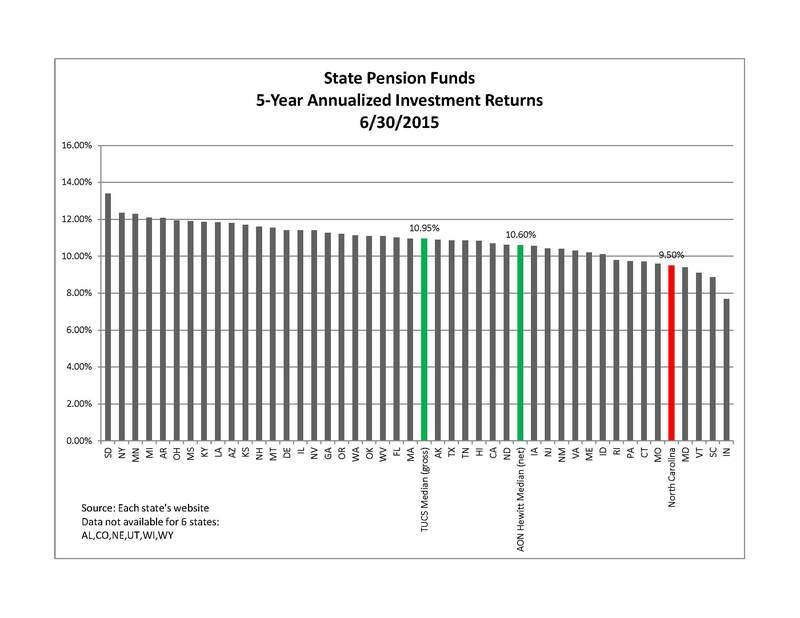 The state pension plan assumes an annual 7.25 percent rate of return on investment. But information distributed at a recent meeting of the Investment Advisory Committee showed the Teachers and State Employees Retirement System had a meager 0.8 percent growth. The situation is no better with other retirement plans managed by the Treasurer’s Office that also carry a 7.25 percent anticipated rate of return. The Local Government Employees Retirement System showed 1.7 percent growth. The judicial retirement plan was negative 1.3 percent. Folwell said there is no acknowledgement of problems caused by maintaining an unrealistic rate of return. “I’m going to recommend to the oversight boards that deal with these issues that the assumed rate of return be lowered because it is the truth,” he said. “The retirement Board of Trustees and the IAC took up the question of whether to lower the assumed investment rate of return earlier this year, but the Board of Trustees approved maintaining the 7.25 percent long-term annual return assumption,” Young said. Information released at the Investment Advisory Committee meeting showed the TSERS plan has $65 billion in assets, but $68.7 billion in liabilities, meaning it is funded at only 94.64 percent. The LGERS account was 98.09 percent funded, and the judicial plan was 92.41 percent funded. In the 12-month period reported, the TSERS plan had contributions of $2,057,963,297, but paid out benefits totaling $4,098,385,865, for a net cash outflow of $2,040,422,568. The LGERS fund had a negative cash flow of $376.4 million, and the judicial plan paid out $8.9 million more than it took in. But Young said North Carolina’s actuaries recently estimated the TSERS plan is actually 95.6 percent funded, according to more recent data, giving it the third-highest funding ratio among public pension funds in the country. During the IAC’s public meetings “it was recognized that the low-interest-rate environment will likely continue to keep investment returns relatively low for a period of time,” Young said. But the General Assembly’s conservative funding policy, and the department’s “long-term and low-cost diversified investment strategy should keep the retirement funds among the most solid pensions in the nation,” Young said. “I think the most important thing that we gleaned from all that information at the Investment Advisory Committee is that our plan is not performing well, and it doesn’t ring an alarm for us. This is not news for us. It’s been a three-alarm fire for a long time as far as we’re concerned,” said Ardis Watkins, spokeswoman for the 55,000-member State Employees Association of North Carolina. Watkins faults what she calls Cowell’s high-risk investment strategy, which receives the General Assembly’s blessings. “I don’t know why this issue is not catching hold because economists from Duke [University], from N.C. State [University], from all over the country, have said that the fees associated with these high-risk, high-fee alternative investments … eat up so much of your plan that they’re a problem,” Watkins said. But the public is kept in the dark by the Treasurer’s Office about who those investment managers are, and how much they are paid by North Carolina taxpayers, she said. An even bigger problem is that high-risk investments promise huge windfalls if they hit, “but more often than not you not only don’t make money, your returns are lower than if you had just put them in a safer investment,” Watkins said. She contends that if during her seven years as treasurer Cowell had simply put the retirement investments in an indexed mutual fund with a portfolio mix similar to the investments of former state Treasurer Harlan Boyles, the fund would have performed 2.7 percent better, and with compounding, that would have produced $20 billion more in investment returns. Ron Elmer, a certified public accountant who lost to Blue in the Democratic primary for treasurer, also has called the state retirement investments into question. Information he compiled shows North Carolina ranked No. 40 among 44 states for which data were available for annualized investment returns over the past five years. He has said the pension fund underperforms 1.2 percent annually compared to the average public pension fund, or the equivalent of $900 million per year, which eclipses state annual corporate tax receipts of $850 million.